Put the diced potatoes into a pot and fill with cold water. The water should just cover the potatoes. Add salt and cook on medium-high heat. When the water comes to a boil, and the potatoes are cooked, drain the potatoes and spread out on a kitchen towel to dry. 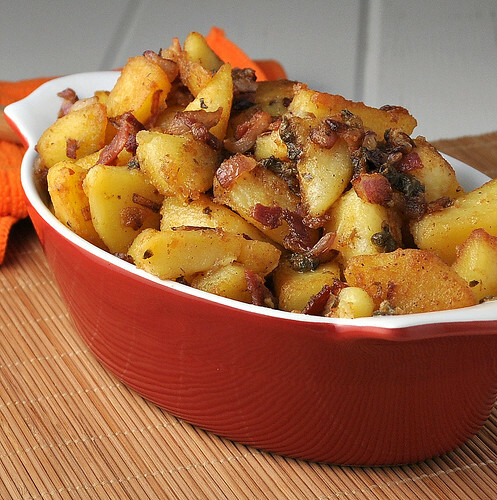 While the potatoes are cooking, add bacon to a large saute pan and cook over a low/medium flame. When the bacon is cooked, remove with a slotted spoon and drain the bacon fat, reserving some if you want to add it later. Wipe out the pan and increase the heat. Add enough canola oil to cover the bottom of the pan and a little but more and heat it until you get some smoke. Once the oil is hot, carefully add the potatoes and shake the pan a couple of times to make sure nothing sticks. Lower the heat a little and let the potatoes brown. Season with salt and pepper. After a few minutes, shake the pan again. When the potatoes are almost completely cooked, add the red onion and let everything cook together. Once the onions are caramelized, add the capers and red wine vinegar and deglaze. When the vinegar is mostly evaporated, add the extra-virgin olive oil, mustard, and bacon (and reserved bacon fat if you want), re-season with lots of cracked black pepper and serve warm. That German Potato Salad Looks DELICIOUS !!!! Looks good and something I will try soon. Have not seen this recipe before.